Palmako Roger 19.0m²: The Palmako Roger Garage is a Garage with a footprint of 3.6m x 5.5m and 3 options of Garage Door: No Door: This Version already has the hole cut into the wall 2400mm Wide x 1988 High (Please note: Height Dimension may vary depending on moisture content of the wood i.e. expansion and contraction) to accommodate your own Garage Door: Double Side Hung Wooden Garage Doors (As shown in main image) Up and Over Style Garage Doors (Spruce Tongue and Grooved Board Clad Door) All versions feature 1 x Pedestrian Access Door and a Window which can be positioned at either side of the building during construction. All Glass is DOUBLE GLAZED. The timber garages have an extremely sturdy roof construction. This wooden Log Cabins Style Garage from Palmako offer an excellent alternative to brick built and at a fraction of the cost! 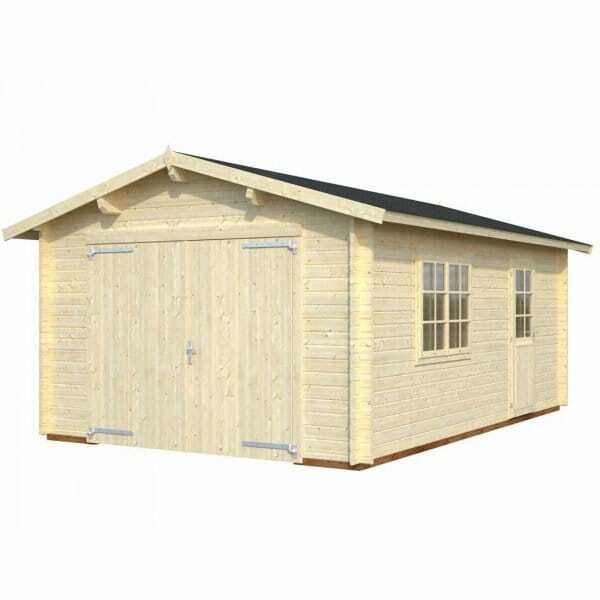 Buy Log Cabin Garages from Simply Log Cabins.